UPDATE: Shashimani passed away on March 19, 2015. You can read her obituary in the New York Times at this link. 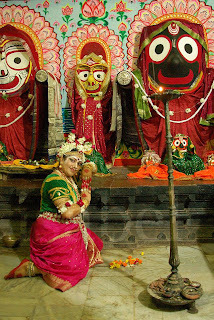 The Maharis were the temple dancers who performed for Lord Jagannath in the Jagannath temple in Puri, Orissa. Dating back to the 12th century, the Jagannath temple is an important place of pilgrimage for Hindus. This temple was also once a great cultural centre where dancers and singers would worship Lord Jagannath through dance and song as part of the daily temple rituals. Shashimani is the last remaining Mahari belonging to this temple tradition. She is now in her late 80s and lives in a lane close to the great temple. Two years ago, while conducting research for an upcoming film on Odissi, I along with the film’s director, Sandrine Da Costa, had the chance to meet Shashimani and have a short discussion with her. We climbed up a narrow staircase to a dark room where Shashimani lives, in the house of a temple servitor. When she was told that she had visitors, she excitedly asked her student who was with her to help her apply the bright red dot of sindoor on her forehead. She wrapped the end of her sari over her head as she received us with her hands joined in a respectful namaste. She sat on the floor of her modest room and motioned for us to sit too. Shashimani told us how she was dedicated to the Jagannath temple by her parents at the age of seven. Through a ceremony called Sari Bandhan she was formally married to the god. “When the marriage knot was tied with Lord Jagannath we became Maharis, she explained. “From that day, we became the wives of Lord Jagannath.” The Maharis would then be considered to be married women and would remain wedded to the god for the rest of their lives. Shashimani stopped dancing in the temple five years ago because she no longer had the stamina to continue. She told us that the Mahari tradition has gradually faded because there are no Maharis left to perform the rituals. “The other Maharis have all passed away and I’m the only one left. How much can I do?” she concluded. For a temple dancer who used to get decked up in silk saris and heavy gold jewellery, Shashimani now lives a very austere life. Unsurprisingly, she expected a donation for the time she spent with us and after refusing the first generous offer, did not hesitate to state her price. This article I came across on the Internet describes her situation in more detail and calls on the temple authorities to assume responsibility for former ‘temple servants’. 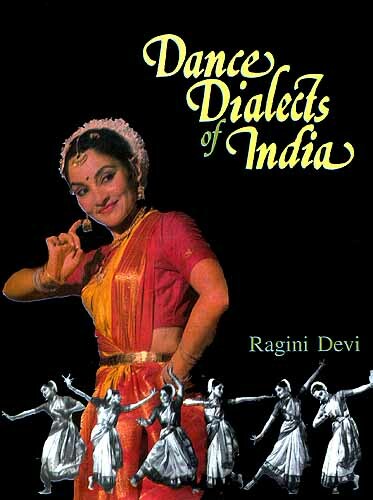 The upcoming film on Odissi will feature video footage of our interview with Shashimani. The film is still work in progress and is expected to be released in 2014. For updates, visit this page. Odissi dancer and scholar Ileana Citaristi, wrote a fascinating detailed account of the lives of the temple dancers of Jagannath temple back in 1985. She has kindly shared this article with Sacred Space - you can read it at this link. When the great temple of Lord Jagannath became the matrix of the religious and cultural life of Orissa, the role of the Maharis in the daily rituals and festivals is clearly defined. It is said that in the 12th century King Chodaganga Deva established seven colonies for temple servants (Sebayatas) adjacent to the temple, and the place allotted to the Maharis was known as ‘Anga Alasa Patna’ the ‘place of bodily gestures’. Maharis are the holy brides of Lord Jagannath. A piece of cloth taken from the idol is tied around the head of the initiate danseuse by the temple priest to symbolize her marriage to the deity of the shrine. Maharis are vowed to chastity and their sacred duties and daily life are supervised by the Mina Nayak and the Sahi Nayak, temple servants appointed by the king. A valuable manuscript, Niladri Archana Chandrika, written by a Mahari of Jagannath Temple, describes the ritual dances of Maharis, and their daily life and customs. Maharis are richly attired for temple service. After bathing, fragrant sandalwood paste is applied to the body. A colourful silk sari of traditional pattern is draped around the body and tied at the waist. A tight bodice covers the breasts. The face is decorated with the sacred ‘tilak’ mark between the brows, and delicate patterns of white dots are applied above the brows and on the cheeks. Fingertips, palms and feet are tinted crimson, and they eyes are lined black with collyrium. The hair is parted and knotted in a chignon wreathed with flowers and adorned with a golden curved disk pierced with a peg of ivory and gold. Beautiful gold ornaments decorate the head, neck, arms, ears, nose, waist and ankles. Covering her head with a veil, the Mahari goes to the temple accompanied by the Mina Nayak. She is escorted to the inner shrine by the Rajguru, who bears a gold-mounted staff as a symbol of the king’s authority. He is always present at the dance rituals, and, after obeisance to the deity, the Mahari bows to him before beginning her dance. There are two classes of Maharis at the Jagannath Temple. The Bheetar-gani Maharis are those who dance exclusively before the deity in the inner shrine. The Bahar-gani Maharis dance in the hall of dance (Nata Mandir) or in the temple courtyard near the Garuda pillar. Other temple servants who render daily service are the Gaudisanis, temple maids who fan the idol with charmaris, Gita-ganis (singers), and musicians who play veena, drone, drums, flute, and cymbals to accompany the dance. There are two daily rituals at Jagannath – one at midday and the other at night. At the midday Sakala Bhupa ceremony when consecrated food is offered to Lord Jagannath, a Bahargani Mahari dances in the Nata Mandir and sacred songs are sung. At night, after the Sanja Dhupa or food offering and just before the ritual adornment of the idol, prior to his nightly retirement, a Bheetar-gani Mahari renders dance and song before the deity. A portion of the food offerings is given to the Maharis, and this is the only food they are allowed to eat on the days of their temple service. 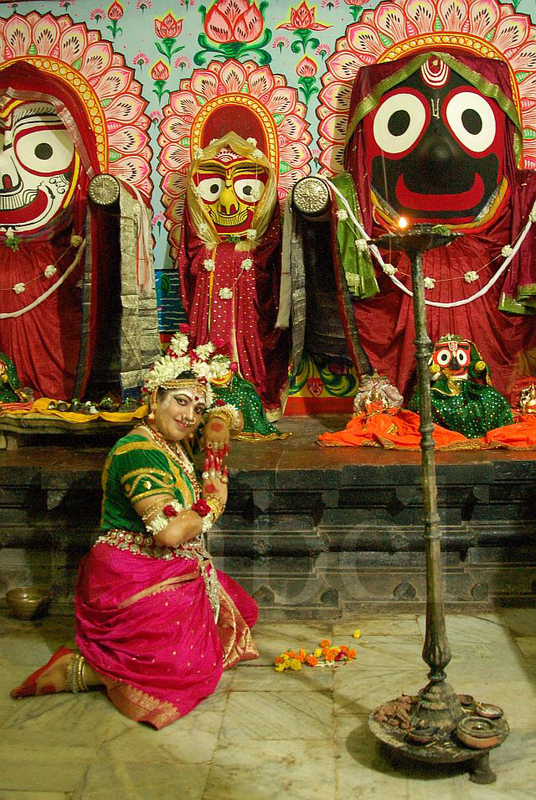 According to temple records there were twenty Maharis serving Lord Jagannath in the 15th century, each dancer taking her turn in the daily rituals, and all of them participating in the religious festivals. There are sixty-two annual festivals in honour of Jagannath and in two of these the Maharis have an important part. In the Chandan Jatra or Spring Festival, the image of Jagannath is taken in procession to a large tank about three miles from the temple and installed in a boat. Two boats are set afloat, one carrying Maharis, and the other Gotipuas in female dress, to entertain Lord Jagannath with songs and dances. In the Jhoolan Jatra the image of Jagannath is placed on a swing, and entertained by Maharis and Gotipuas with songs and dances. Maharis, as a community of Jagannath, were exclusive teachers of their art. It was a custom for Maharis to adopt daughters and train them for dance service in the temple. Thus the dance retained its artistic purity and sanctity for at least six hundred years. I am pasting excerpts from my article "A devadasi in the temple of Shiva" related to the very first trip Shashimani did outside Puri, to participate in the Natyanjali festival at Chidambaram in 1994. ..."All this was particularly felt in Chidambaram during the Natyanjali festival 1994, in the presence of a minute and highly charged little woman of 72 years, Shashimani devadasi, one of the last surviving exponents of the Puri Jagannath tradition of temple dancers. By the time the organisers wrote me a letter asking to come to Chidambaram to read a paper on 'Temple dancers tradition', possibly accompanied by one of them, the one whom I taught I would contact first, Kokila Prabha, had just passed away one month before. With her the 'seva' of singing the Geeta Govindam' inside the 'garbhagriha' at the time of Jaganath going to sleep, came to an end. It seems none of the surviving ones belonging to the same category of 'bithare gauni' were eligible for this privileged 'seva'. Shashimani devadasi was a revelation; she turned out to be a storehouse of knowledge as far as 'sangeeta' and 'kavita' were concerned. 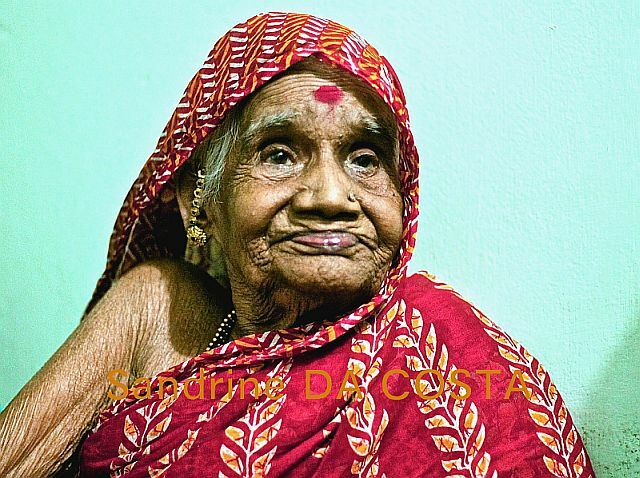 Not able to be on her own due to poverty, she had been staying since the past 30 years in the house of a 'panda' helping his family in providing 'betel pan' to the temple as a daily 'seva' to Lord Jagannath. The strict rules of the house where she lived and her poor health prevented her to pursue a carrier as music and dance teacher all these years. Although she had stopped performing the 'seva' in the temple since more than 30 years , she was still very proudly maintaining the 'seva' of the role of Yasodha during the enactment of Krishna's birth as it is performed at the Janmasthami celebration. But it all came back once again the moment she started singing the traditional Odissi and Champu songs learnt in her childhood; her hands and feet started moving the way 'Mohan master' had thought her and we could have a glimpse of how the dance must have been when it was meant to be for Jagannath and not for the public. Many thanks Ileana Citaristi for sharing this fascinating account! Thanks for your detailed interview .. I could know more about her... Few years back her story came in one Bengali Paper. Thanks for sharing your experience with us..this helped me a lot in a project in which I am working, i.e on the lifestyle of Maharis. while reading the post of Ileana ji i felt as if i am standing in front of Lord Jaganath and Chidambaram. description of respected mahari Shahshimoni performance seems as if i am watching her. 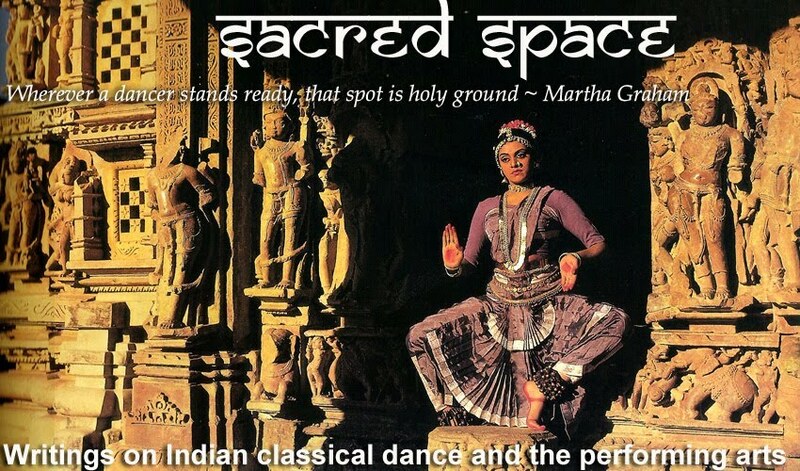 thnx for such informative post on mahari dance.